RIYADH, 10th November, 2018 (WAM) -- The Custodian of the Two Holy Mosques, King Salman bin Abdualziz Al Saud of Saudi Arabia, and His Highness Sheikh Mohamed bin Zayed Al Nahyan, Crown Prince of Abu Dhabi and Deputy Supreme Commander of the UAE Armed Forces, discussed ways of further consolidating the robust brotherly relations between the two countries along with an array of regional and international issues of common concern. This came as the Saudi King welcomed Sheikh Mohamed and his accompanying delegation today at Al-Auja Palace, Riyadh. King Salman commended the progressively solid relations between the two sisterly nations and their peoples. 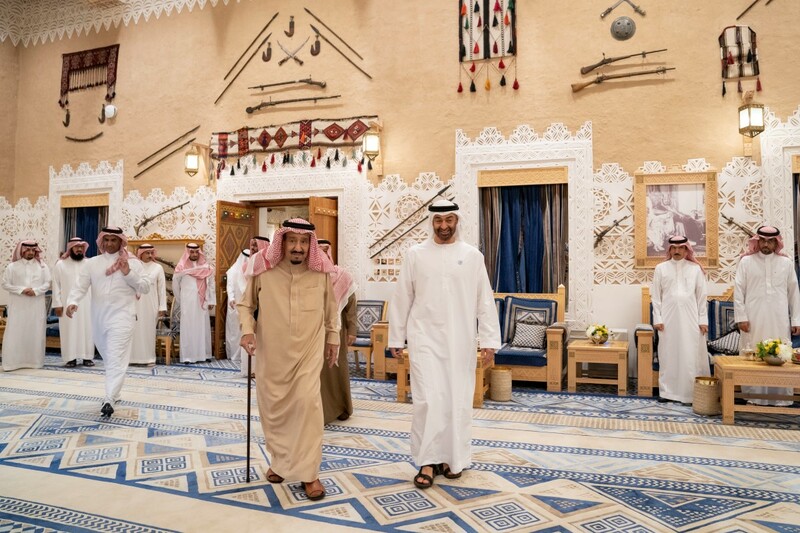 Sheikh Mohamed conveyed to King Salman the greetings of President His Highness Sheikh Khalifa bin Zayed Al Nahyan and his wishes for further and continued prosperity and progress to the Kingdom. King Salman reciprocated the greetings to President Sheikh Khalifa, wishing him good health and continued progress to the UAE. The two leaders addressed ways of widening collaboration and coordination across all fields to the higher good of both nations in particular and to the best interest of the entire region in general. The latest developments in the region, including the ongoing challenges and crises, were reviewed as well by the two leaders. Sheikh Mohamed reaffirmed the solid basis the bilateral relations are founded on and the balanced approach they adopt towards various regional and international issues. 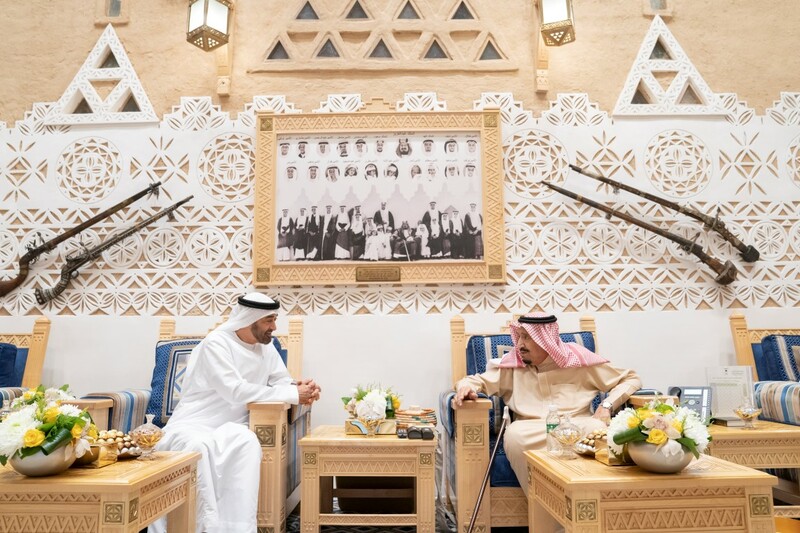 "The UAE-Saudi ties are a model to be copied for how relations between world countries should be and they reflect the two nations' profound awareness of the regional developments," said Sheikh Mohamed. Highlighting the Saudi Arabia's pivotal role in countering risks besetting the Arab World, His Highness Sheikh Mohamed bin Zayed expressed his confidence that Saudi Arabia - thanks to its wise leadership and strong people - would continue to play that role for protecting the Arab interests and providing all drivers of progress and development for Arab peoples. 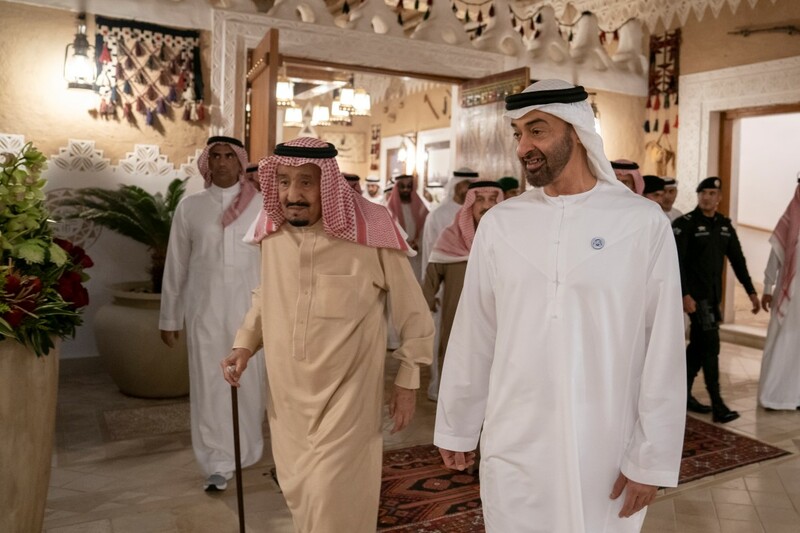 ''The UAE will remain steadfast in one trench with its Saudi brothers out of its unequivocal belief in our common goal and destiny,'' he affirmed. 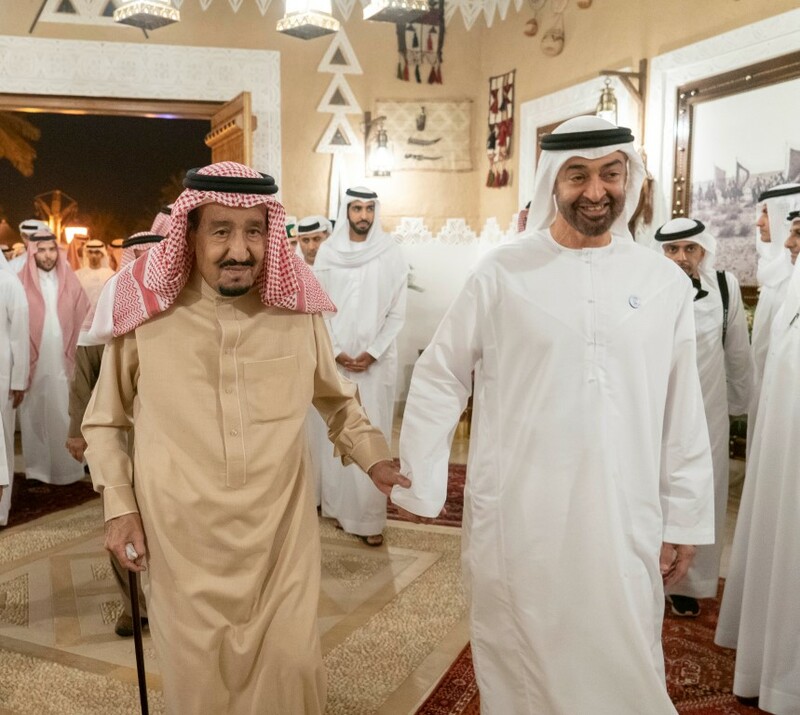 The Crown Prince of Abu Dhabi added that the prudence of King Salman and his far-sighted vision and brave stances constitute the safety and stability valve in both the Kingdom and the region at large. He expressed his appreciation for the leading role assumed by King Salman in reinforcing security and stability in the region and protecting the interests of Arab countries and peoples amid the ongoing challenges and threats. The meeting was attended by a number of senior UAE officials, including H.H. Sheikh Tahnoun bin Zayed Al Nahyan, National Security Adviser; Sheikh Zayed bin Hamdan bin Zayed Al Nahyan; Sheikh Shakhbout bin Nahyan Al Nahyan, UAE Ambassador to Saudi Arabia; Dr. Anwar Gargash, Minister of State for Foreign Affairs; and Reem bint Ibrahim Al Hashemy, Minister of State for International Cooperation. A number of Saudi royal family members and top officials were also present. 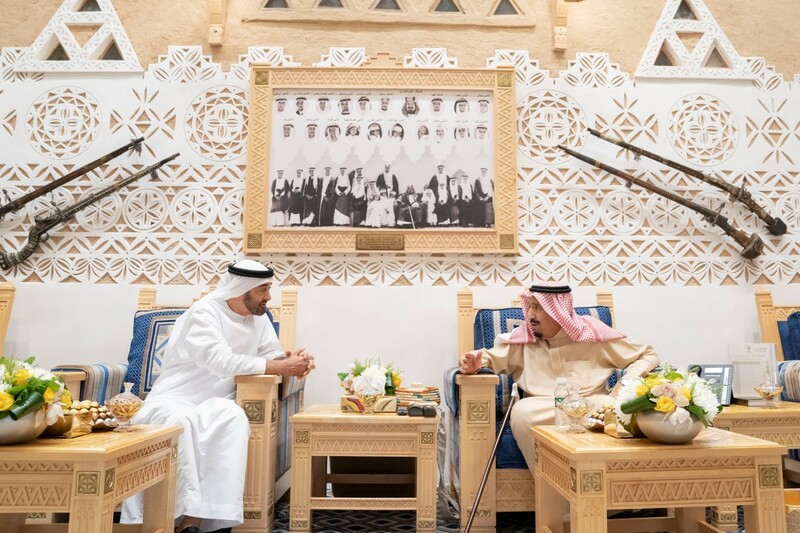 Sheikh Mohamed arrived in Riyadh earlier today on a brotherly visit to Saudi Arabia and was welcomed upon arrival at King Khalid International Airport by Prince Faisal bin Bandar bin Abdul Aziz, Governor of Riyadh.